Yay for peach season! 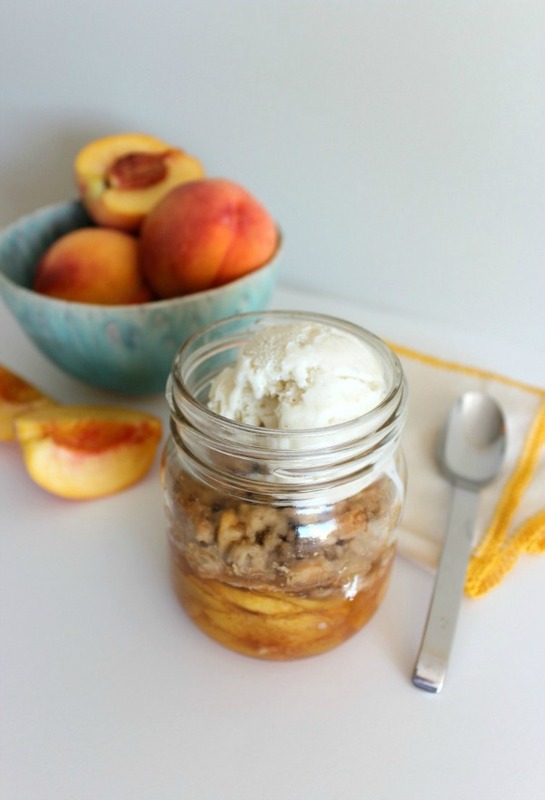 Right now I’m thinking about canned peaches, peach pie, and one of our favourites, peach crisp. Let’s try baking it in a jar! Are you ready for peach season? It’s definitely one of my favourite fruits, especially this time of year when they’re so juicy and sweet! Growing up, my mom made jars and jars of canned peaches, as well as the best peach pie I’ve tasted to date. I wish I inherited her ambition when it comes to those sorts of things, but around the kitchen, I tend to go for quick and easy. That’s where fresh peach crisp in a jar comes in. This peach dessert recipe is so easy to make and fun for the whole family to eat. Made with layers of sweet and juicy peaches topped with a cinnamon oat crumble. For entertaining, get it ready ahead of time and warm a bit before serving. So simple. Fill a large pot with water and bring to a boil . In a large bowl in your sink, prepare an ice bath. Quickly immerse the peaches in the boiling water and transfer to the ice bath. Peel the skins and cut into ¼” thick slices. In a bowl, combine the peaches, sugar, cinnamon, tapioca and salt. Spoon equal amounts of the mixture into four 15 oz. jars (I used Canadian Gem jars). Preheat the oven to 400°F. Mix the butter, brown sugar, flour, cinnamon, oats, and walnuts until you’re left with crumbs and small chunks of topping. Loosely spoon over top of peach filling in the jars. Place the jars on a rimmed baking sheet and bake for 18-20 minutes. Next, rotate the baking sheet, turn the heat down to 350 degrees, and bake for approximately 5 more minutes. The filling should be bubbling vigorously and the topping should be golden brown. Allow the jars to cool down a bit and serve with a scoop of vanilla ice cream. Want to make this delicious peach crisp? Pin it for later! 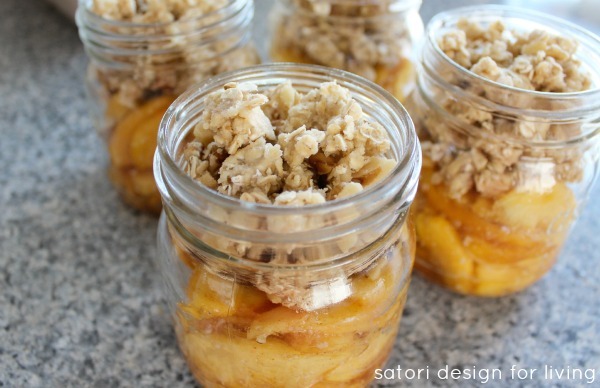 This peach crisp recipe combines a layer of sweet and juicy peaches topped with cinnamon oat crumble baked in individual jars. Fill a large pot with water and bring to a boil . In a large bowl in your sink, prepare an ice bath. Quickly immerse the peaches in the boiling water and transfer to the ice bath. Peel the skins off the peaches and cut into ¼" thick slices. Allow the jars to cool down and serve with a scoop of vanilla ice cream or frozen yogurt. Oh so peachy! 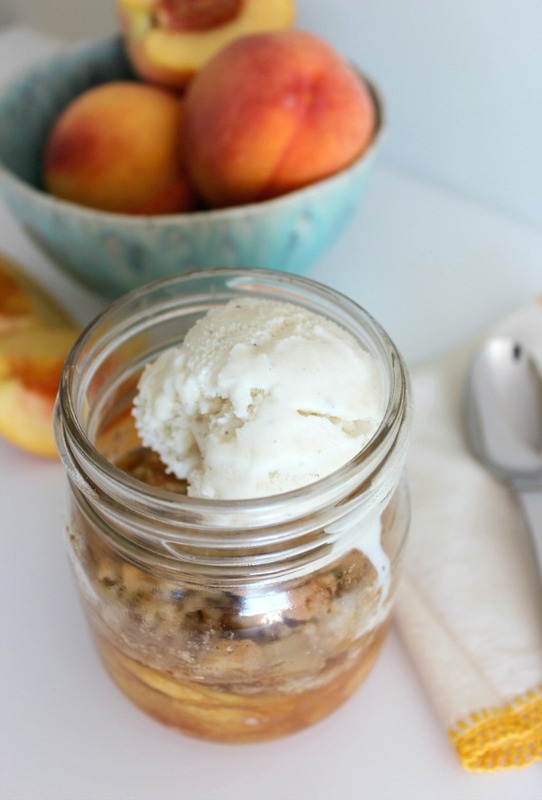 Thanks Shauna, your peach crisps in a jar look soo yummy – thanks for the recipe! This is a great idea for a gift or party favor! I’ve pinned it so that I can give it a try. I found your post at the the Fun in Functional link party. I hope you will stop by my blog and take a look. Have a great weekend! Oh wow! Yummy!! I will be making that sometime soon. Oh that recipe looks amazing! I am so pinning this for the end of the summer! I just picked up some great peaches at the farmers market this weekend! This looks incredible! Love the cute way to serve these. You may have inspired me to go to the grocery store later ;) Thanks for sharing! !